The official narrative goes something like this: there is a listings supply crunch in Toronto which led to double digit growth in housing prices. 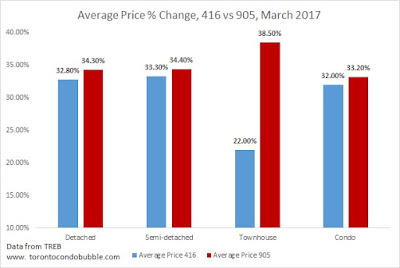 Prices will continue to rise significantly until there is a marked number of homes available for sale. 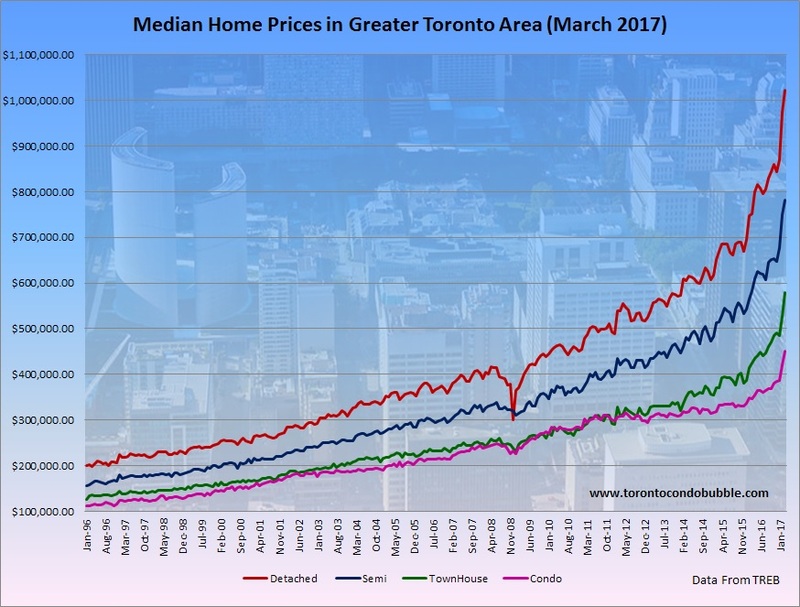 Average home price in Toronto increased 33.2% in March 2017 over the same period last year. Let's say you own a million dollar house in the GTA. Why would you want to sell it now when it can go up in price by another 30% by March of 2018? If you wait a year, you could pocket another $300,000. That's probably several years of annual after tax income right there. 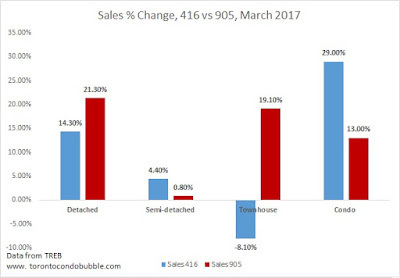 Listings crunch is a direct result of the housing bubble mentality. People will hold on to their homes for as long as they can, before they sell and downsize. 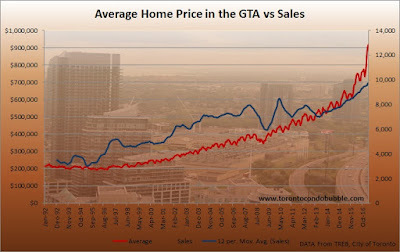 If housing is an investment, why would you want to sell, especially if it keeps growing at the fast rate to date. Besides, most of the boomers have yet to cash in on their detached homes before they downsize. But can millennials afford it? 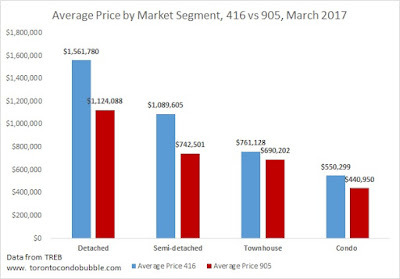 Interestingly the price growth was fastest in suburbia across all market segments. In fact town homes in the suburbs grew the fastest, with the average price up by a staggering 38.5%. Average detached price in the City of Toronto was $1,561,780 in March 2017. 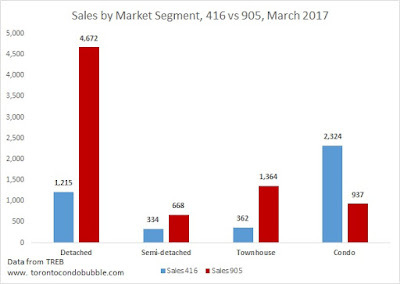 Average semi-detached price in 416 was $1,089,605. Average town house price in 416 was $761,128. Average condo price in 416 was $550,299. Really insane amounts above considering that the median hourly wage in the City of Toronto was $22.00 in February 2017. That is less than $3,000 after tax. 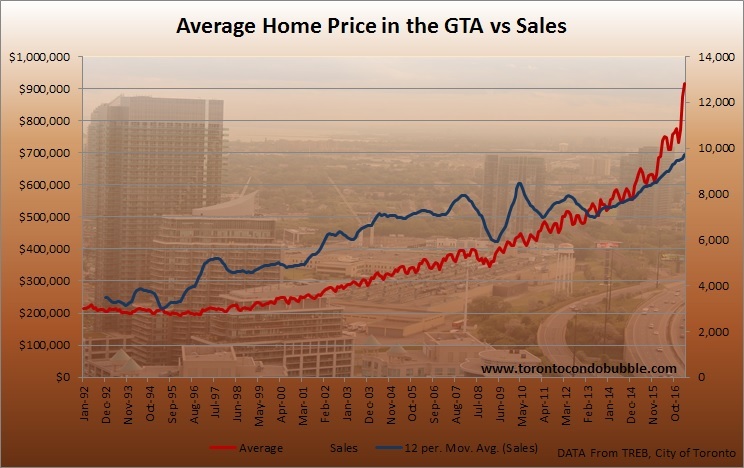 Five year fixed mortgage payment on an average condo in the 416 would eat all of your income.